Real Life LEED: ...and we're off!!! Real Life LEED has promised to be a blog for the LEED AP, by a LEED AP (FLAP-BLAP 4 txtrs). For this reason, I've made a policy of not pointing out every new project that earns certification, but please forgive me for announcing that I've officially sent off the first LEED project I've worked on from start to finish to the GBCI for a combined design and construction review! I'm sure that's when most LEED AP's celebrate anyway... We're expecting Gold, so wish us luck, though I've got a number of buffer points saying you won't need to! I love the smell of green checkmarks in the morning! I've worked on other projects in a limited role, and have sent off others for reviews, but this is the first one where my name is on the top line of all of my firm's credit submittals. Once the reviews come back, there will be a number of posts discussing some of the issues we faced in design and construction, what I learned corralling paperwork, an update on where the GBCI is falling with review delays, and proper recognition of all involved (my involvement was pretty much limited to LEED paperwork and coordination)! Coincidently, this project was most of my test-prep for the LEEDv2.2 exam... It was registered originally as a LEED-NCv2.1 project. I was tasked with going credit by credit to determine which would shine more favorably on this particular project, a task that required me reading the reference guides for both 2.1 and 2.2 and writing summaries of the differences. That, along with the online USGBC class was pretty much what comprised my studying for the test. ...I've once again slipped into my typical summer non-posting ways! That will change in the next few weeks as I profile some user issues with the new LEED-Online, start planning for my first Greenbuild trip, and update recommendations on how to study for the new v3 series LEED AP exams... if the USGBC's official guides would ever come out (supposedly available October 09... it was September a few weeks ago and "Summer 09" a few months ago). Stay tuned! Congrats! I'm similarly excited as I've just submitted Construction clarifications for what will (hopefully by the end of this month) become the first LEED project I've worked on from start to finish to achieve certification. Hooray! That's great, Joel. I submitted my first complete (start-to-finish) project at the beginning of the year. I admit I had a few sleepless nights until the review comments arrived a couple of months later. Happily, we were able to address each and every comment to the GBCI's satisfaction and achieved the targeted Gold Rating. Good luck! Congrats! When I get the review back from the GBCI I'm going to do an update about any remaining review delays (if any). It was really bad last year, but I get the impression they're going down. If it's not too much trouble, I'd be curious to know how many business days it took from the day you submitted until you got the preliminary review back, and also the same information for your resubmission to final review time... I completely understand if you don't want to slog through emails and such to find out, but I figured it couldn't hurt to ask! Ditto on project delays (or lack of)... any info is appreciated! YES, Timeline... I'm keeping track and in the process of writing a comparitive memo myself. Let's compare notes when all is said and done. On prelim wait times - we submitted an NC v2.2 project for Design App review 6/22/09 and received review comments back on 9/4/09. Does that sound like an improvement? Also, can anyone please please advise if there are times when templates don't actually report what we fill out?! some of the clarifications being requested sound like the reviewer thinks we didn't put data in the calculation fields and only read the narrative part which of course won't tell the whole picture. 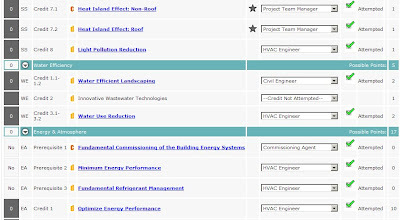 We submitted both design and construction credits for our NC 2.2 project March 24, 2009 to GBCI. They notified us that they were beginning the review on April 15 and received the preliminary review comments around the middle of July. We submitted our responses on August 11, and received our award by the beginning of September. All in all around 5 months from start to finish. Credits that they asked for more info on were EQp1, EAc1, EQc4, SSc5.2,SSc6.1,EQc6, EQ8, and an ID. We had heard a rumor that they only audit 6 credits but that appears to be an inaccurate statement. In addition, there were a couple of mistakes made on their end with the review asking for further data that we had already supplied. What was really important to hear is that, for EQp1, T24 compliance does not mean ASHRAE 62.1 compliance. Calculations must be done by zone. Our project was submitted on March 25th, and preliminary review comments were received May 15th. We returned it to the review team with our responses on June 12th, and received official notification of certification on July 17th, though I noticed that the credit summary had been updated to change the "denied" and "clarification requested" credits a week or two prior to that. I'm really interested in the responses folks are getting back from GBCI reviewers. We have had three design reviews come back so far and there are numerous credits with which we completely disagree. In a few instances they are actually changing the game mid-stream and requiring new documentation that is not mentioned in the reference guide or LEED online. So, do you agree with your responses or do you believe they are unfair or inaccurate? Yes, we had design review credits returned asking for more than has ever ever been documented by LEED. One question I have is - now that we're in construction phase submittals, our engineer had to rerun his model based on a different roof insulation value and the energy points are the same, but the % value he got is slightly different. Do we really need to resumbit the energy credits or notify LEED of the new value?